Lune Valley Ocean Wavers is an American Square Dance club with up to 100 members . The Club offers American Square Dancing from beginner up to plus levels. The club meets in The Centre @ Halton on Mondays (7.30pm to 10pm) for beginners and Mainstream and the next level, Plus, at the Caton Institute on Fridays. Lune Valley Ocean Wavers Club, recruits new dancers every two years, allowing our previously recruited dancers time to hone their newly learned skill. Our club is the only Square Dance Club in the area which will have beginners classes this year. 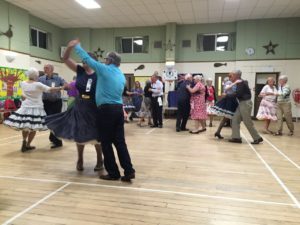 The Club also holds dancing events for the whole club which are attended by visiting square dancers from throughout the UK and other countries. These are usually held at The Centre @ Halton because of the larger number of dancers.The majority of our members come from Lancaster & Morecambe area but some are from Lytham, Hambleton, Garstang, Preston, Kendal, Keswick etc. Square dancing is a worldwide hobby that keeps both body and especially the mind fit and healthy. A recent health study on dementia and Alzheimer’s suggested that dancing and learning something new, noting Square Dancing in particular, was an excellent way to help to combat these diseases. While keeping supple and having fun you will probably learn and remember hundreds of moves from various positions over the course of your first two years. There is an opportunity to join a Beginners Square Dance group on Tuesdays – starting on Tuesday 8th January 2019. Lune Wavers Square Dance takes on beginners every two years. 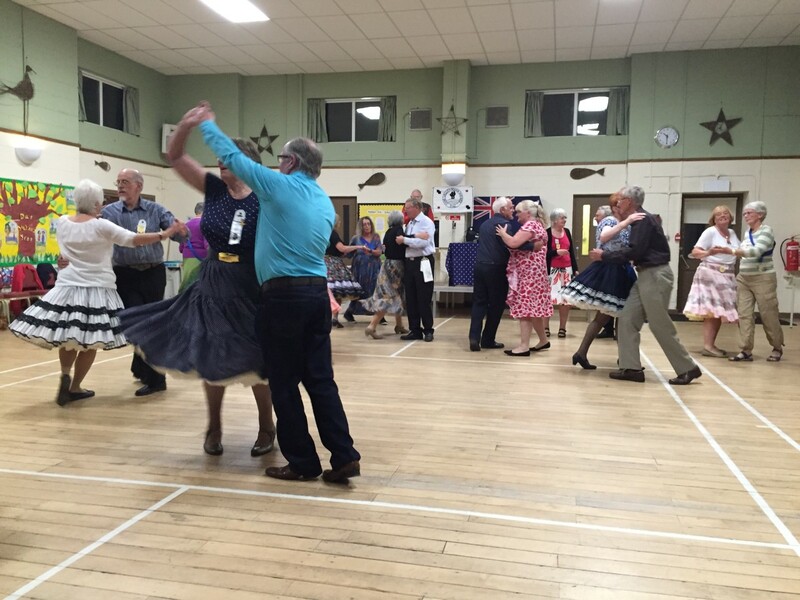 If you missed joining the main sessions on Monday nights last October, or who cannot get to dancing on a Monday and would like to learn to Square Dancing, you can join Carol’s Practice group this January. It’s also suitable, for anyone who would like extra practice, or missed some sessions or had a break due to ill health for instance. In a large group like Monday nights, it is hard to provide much individual tuition when everyone else wants to get on and dance, so this small group fills that gap to provide the extra practice and individual tuition that may be needed. Carol will take this new group through the whole programme as a companion to Monday evenings. The classes will be held upstairs in the Centre @ Halton which will hold a maximum of 2 squares dancing (ie 8 people). We will meet most Tuesday Evenings, entry 7pm for 7.15pm to 9.15pm and exit 9.30pm. All sessions depend on the room, the students and Carol’s availability. I need at least 4 ‘Boys’ and 4 ‘Girls’ with some extras to fill in so 10 people minimum to start the classes. She says ‘We walk through every move in detail and practice till everyone has got it. Most moves are picked up easily but some seem a little harder as we move on through the programme. Hopefully I can nip any bad habits I see in the bud before they get established, and will show you how to execute the moves correctly using body flow for your own comfort and that of other dancers. I will call pattern and singing calls, as on a Monday night and may use the odd CD later on to add to your experience. You will be gaining dancing experience from the lessons and will be helping me at the same time gain more experience with my calling, as learning to call is an ongoing and a long term work in progress. The cost of the room hire will be shared by the students, so the more that come the cheaper it becomes. I will provide soft drinks, teach and call the sessions at no cost. If you are interested in joining me, please call Carol tel: 07981 743959. Ladies please say if you want to dance as ‘Boy’ or ‘Girl’. More details of Ocean Wavers and its dancing and social events are on the Club website at www.oceanwavers.co.uk. Contact Sheila on tel: 01524 411439 or Carol on tel: 01524 811444.